, earl of Liverpool, was the eldest son of colonel Charles Jenkinson, who was younger son of sir Robert Jenkinson, the first baronet of the family. * Some of the city were so much freedom, and afterwards chose master satisfied with the part he acted in this of the Sailers’ company, Wynne, p. affair, that he was presented with his 57. | Colonel Jenkinson, who died in 1750, had married Amantha, daughter of Wolfran Cornwall, a captain in the royal navy, by whom he had the subject of this memoir, who was born May 16, 1727, and educated at the Charter-house. He went afterwards to University college, Oxford, where he took the degree of M. A. in Nov. 1752, and thence came to London, having previously distinguished himself by the active part he took in an election controversy for the county of Oxford, where his alliances were numerous, and not unconnected with the contending parties. On this occasion his literary talents were supposed to have contributed materially to the interests of the side he espoused; and those talents are likewise said to have been sometimes displayed in the Monthly Review about the period of its commencement. By the first earl of Harcourt, who was governor to the king, when prince of Wales, he was introduced to his majesty, and through the same channel obtained the notice and confidence of the eail of Bute, to jvhom he was private secretary. In 1761 he sat in parliament for Cockermouth, and held the office of under-secretary of state. In 1763 and 1764 he was secretary to the treasury; in 1766 he was nominated one of the lords of the admiralty; and from 1767 to 1773, was a lord of the treasury. 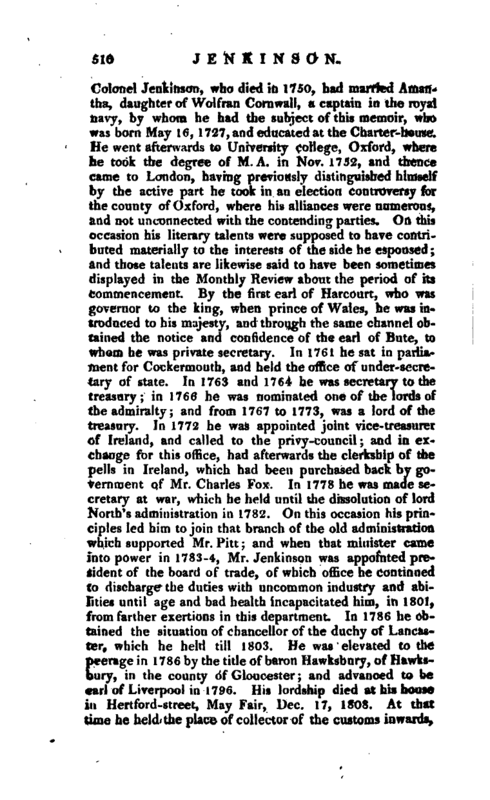 In 1772 he was appointed joint vice-treasurer of Ireland, and called to the privy-council; and in exchange for this office, had afterwards the clerkship of the pells in Ireland, which had been purchased back by government of Mr. Charles Fox. In 1778 he was made secretary at war, which he held until the dissolution of lord North’s administration in 1782. 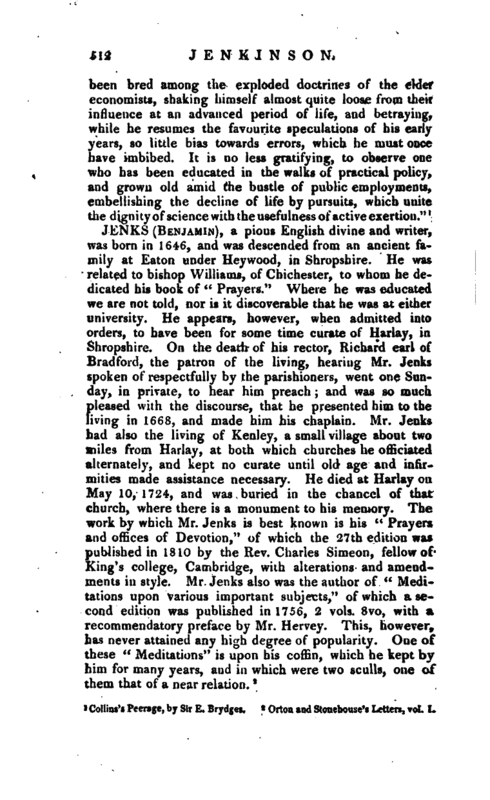 On this occasion his principles led him to join that branch of the old administration which supported Mr. Pitt; and when that minister came into power in 1783-4, Mr. Jenkinson was appointed president of the board of trade, of which office he continued to discharge the duties with uncommon industry and abilities until age and bad health incapacitated him, in 18CU, from farther exertions in this department. In 1786 he obtained the situation of chancellor of the duchy of Lancaster, which he held till 1803. He was elevated to the peerage in 1786 by the title of baron Hawksbury, of Hawksbury, in the county of Gloucester; and advanced to be carl of Liverpool in 1796. 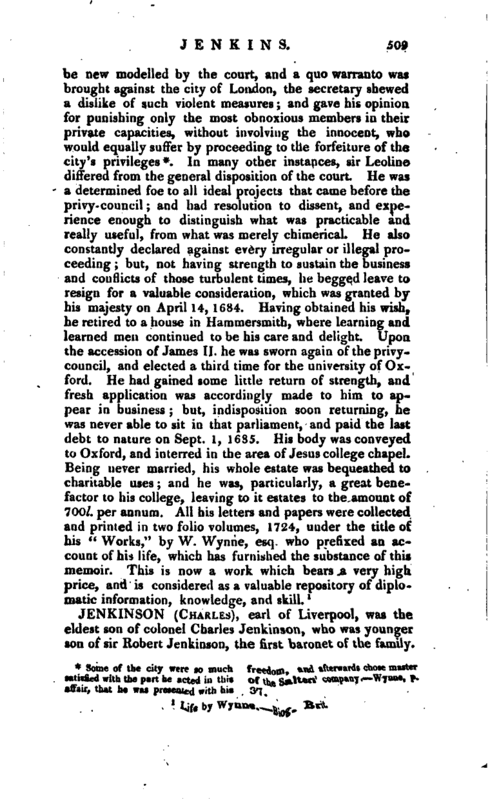 His lordship died at his house in Hertford-street, May Pair, Dec. 17, 1808. At that time he held the place of collector of the customs inwards, | in the port of London, and clerk of the pells in Ireland. He was interred in the family vault at Hawksbury, in Gloucestershire, and was succeeded in honours and estate by his eldest son, Robert Banks, second earl of Liverpool, and now first lord of the treasury. The late earl of Liverpool made a very conspicuous figure during the whole of the present reign as a statesman; and for the greater part of it, shared the severe obloquy which attached to all the confidential friends of the Bute administration; and as he possessed the favour and confidence of his sovereign, he was called the king’s secret adviser. A suspicion of this kind the people were taught to cherish with uncommon animosity. Burke’s celebrated pamphlet on “Popular Discontents” encouraged the notipn; and the leaders of this party of supposed private power, were the incessant objects of clamour with the multitude and the disaffected. 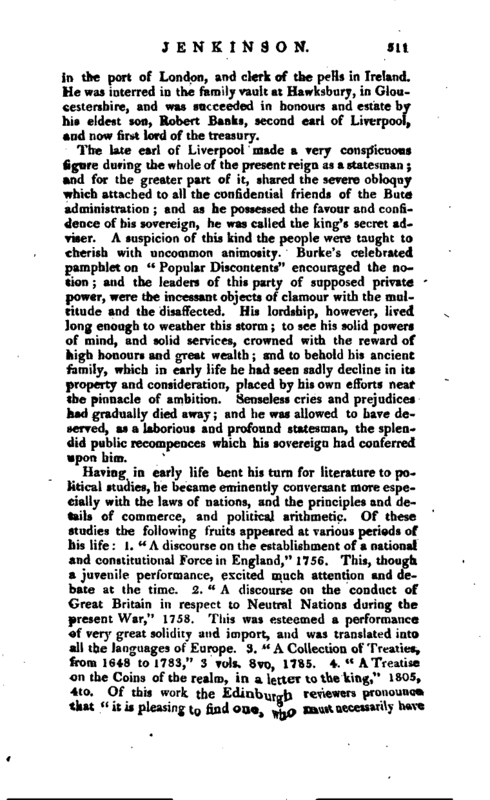 His lordship, however, lived long enough to weather this storm; to see his solid powers of mind, and solid services, crowned with the reward of high honours and great wealth; and to behold his ancient family, which in early life he had seen sadly decline in its property and consideration, placed by his own efforts near the pinnacle of ambition. Senseless cries and prejudices had gradually died away; and he was allowed to have deserved, as a laborious and profound statesman, the splendid public recompeuces which his sovereign had conferred upon him.